Fold uses a high quality track to allow any Deanta Door to effortlessly glide across the system. Room dividers offer a vast array of different options to choose from. A room divider can bring that flexibility to a property that is not always afforded by merely using walls to separate rooms. Numerous confi­gura­tions can be created to suit any home. Fold is a complete off-the-shelf solution allowing you to quickly and easily install your chosen confi­gura­tion. Deanta have specially designed the track and bearings and put them through rigorous testing to ensure they can withstand the extra weight you would come to expect from a Deanta door. This ensures that your doors will effortlessly slide every single time, and will last for years to come. The Deanta Fold Frame System offers you the freedom to choose any door from the Deanta range to achieve the look you want. Deanta supply door linings in oak, walnut and primed to match any door you choose for your Deanta Fold system. Fold by Deanta is a brand new stylish room divider solution. Fold uses a high quality track to allow any of our doors to effortlessly glide across the system. Room dividers offer a vast array of different options to choose from. A room divider can bring that flexibility to a property that is not always afforded by merely using walls to separate rooms. Numerous confi­gura­tions can be created to suit any home. Deanta Fold is a complete off-the-shelf solution allowing you to quickly and easily install your chosen confi­gura­tion. Deanta have specially designed the track and bearings and put them through rigourous testing to ensure they can withstand the extra weight you would come to expect from a Deanta door. This ensures that your doors will effortlessly slide every single time, and will last for years to come. The Deanta Fold Door System offers you the freedom to choose any door from the Deanta range to achieve the look you want. Deanta supply door linings in oak, walnut and primed to match any door you choose for your Deanta Fold system. 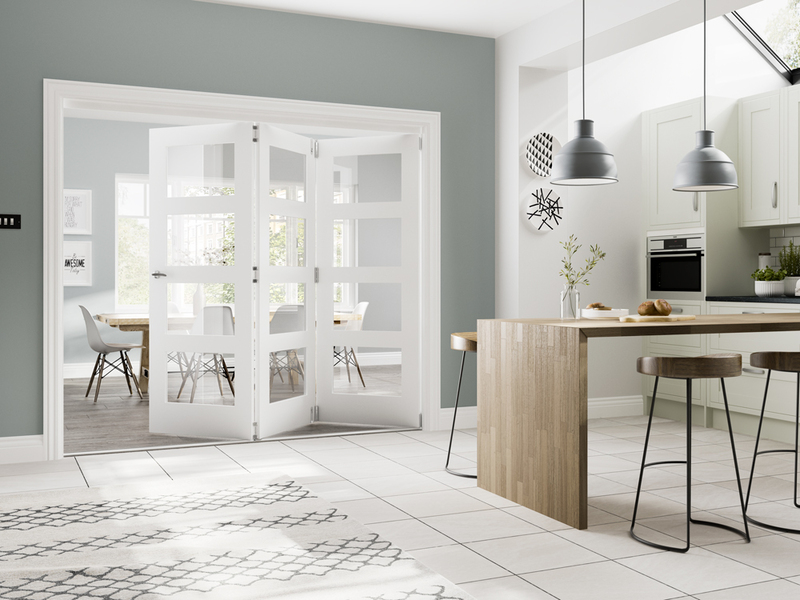 Designed to complement Deanta Internal White Primed Doors. Products are not handed (left or right) and are therefore options are also available in their mirrored versions. Fold White Primed veneered Room Divider Door Frames are manufactured from engineered door components which can include MDF, particle-board and laminated timber. They are supplied with track and sliding/­folding door hangers - for internal domestic use. Doors need to be ordered separately and additionally to the White Primed Fold Door Frame & Track System. The Fold White Primed Door Frame Room Divider is only available when purchasing with Deanta Doors. Whether you want to make one room into two, or two rooms into one the Freefold Folding White Primed Door System is your ideal choice of Room Divider. - The creation of two rooms by closing all of the doors. Deanta Fold White Primed Frames & Doors have a copy of the manufacturers instructions included in the packaging. - We cannot exchange Fold White Primed Door Frame Systems after order - Deanta Fold White Primed Door Frame Systems are supplied as a Special Order.